"All that a good night out can be. Fine company with friends and strangers. Outstanding ethical food and beautiful music." Join us for intimate evenings of homegrown food, music and community. A three course feast of local, seasonal, sustainably sourced food, with three sets of live music, intimately performed by candlelight, plus cocktails served on arrival, handmade chocolate and locally roasted coffee. We host connection, conversation and collaboration. My trip to Morocco over Christmas inspired me to create a dish that has all the flavour and colour of the African continent using UK grown fresh produce. "Such a unique and wonderful evening in such a great setting. We loved it and it made me feel so proud of all the quirky, talented and typically British creativity you and your friends embody." "It was as if you had cooked all the love and music in the room into the food, so that eating it was not only delicious, but just magical and up-lifting." "Thank you for one of the most amazing, intimate and magical evenings I've ever had. One of the best nights of my life, honestly!" "Such a lovely evening - it was a great way to see friends and enjoy meeting others in a really relaxed environment. We loved the creativity, of food and music and ambience." "Thanks so much to all of you for an amazing evening - we had a really fantastic time and came away feeling uplifted and inspired! Enjoying the CDs we bought too!" Thank you again - there was not a single moment from the first smiley welcome, through all the food and music, to the last hug goodbye, that wasn’t perfect." "The supper club was a warming celebration of the good things in life. Some days you just don't feel great, the negative aspects of our society become burdensome. Evenings like Friday are the opposite, they lift the spirits. I left HGSC feeling grateful to be alive and excited to collaborate and celebrate our collective talents!" 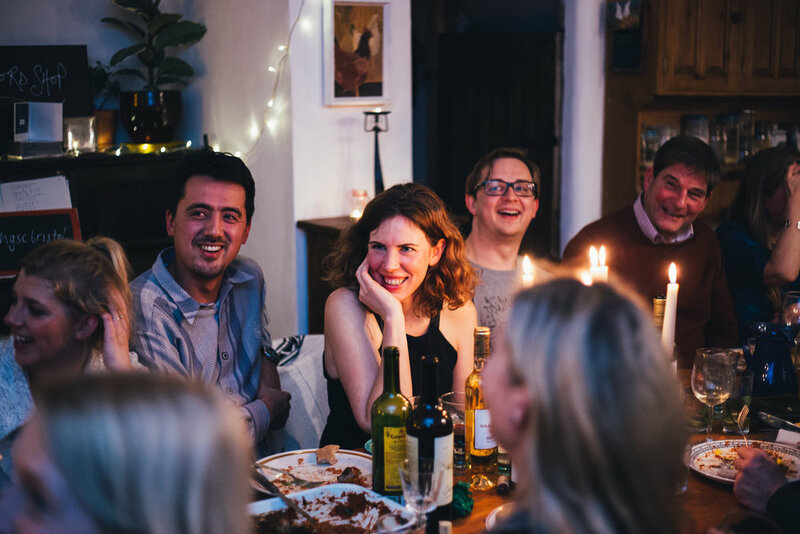 Sign up to our mailing list to find out about our next pop-up supper club. A snap-shot of one of our Supper Clubs at The Forge, Bristol.